Is that another historic boxing rematch we see on the horizon? 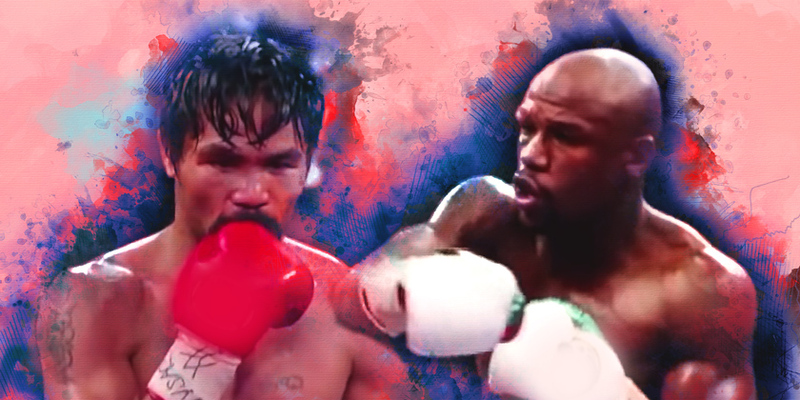 According to both camps and multiple reports, undefeated Floyd “Money” Mayweather will come out of retirement for a second time to fight Manny “Pac Man” Pacquiao in a rematch from their 2015 bout dubbed as the Fight of the Century. Mayweather took to social media over the weekend, posting a video of both he, Pacquiao, and their entourages during an altercation at a music festival in Tokyo, Japan. “I’m coming back to fight Manny Pacquiao this year. Another 9 figure pay day on the way,” stated an adamant Mayweather on Instagram. Details of the fight haven’t been officially announced yet, but Mayweather and Pacquiao both have expressed that they would like to take the ring in December 2018. Both fighters have also stated negotiations and a deal will likely be done very soon. At 41 years old, Mayweather boasts a 50-0 overall record, standing 5’8, and weighing in at 150 pounds. At 39, Pacquiao holds a 60-7-2 record, standing 5’5, and weighing in at 146 pounds. This altercation comes three years after Mayweather defeated Pacquiao by unanimous decision. The first match between Pacquiao and Mayweather was underwhelming and mostly defensive. Both fighters didn’t take a lot of risks and waited for the other person to strike so they could counter and take momentum of the fight, which caused an uproar on social media as one of the most underwhelming matches in recent memory. Pacquiao suffered a tear in his rotator cuff prior to their fight, and he only landed 81 out of 429 punches (19%) in the first contest. Reports surfaced after the fight that Mayweather would fight the Filipino one full year after he had shoulder surgery. Fast-forward three full years later, and here we are. Though Mayweather hasn’t been as active as Pacquiao in the ring since their last bout, he defeated Andre Berto in 2015 and knocked out UFC’s Connor McGregor in the tenth round of their 2017 contest to reach 50-0, officially retiring from boxing with a perfect record. In the other corner, Pac Man has squared up with quality opponents in the last three years. After defeating Timothy Bradley Jr. and Jessie Vargas in 2016, Pacquiao suffered an unfathomable loss to Australian boxer Jeff Horn in his lone fight of 2017, in which led many to believe that the Pac Man’s career was ultimately finished. One calendar year later, Pacquiao defeated Lucas Martin Matthysse by technical knock out to claim the World Boxing Association World Welterweight Title for the first time in his career. This fight will be different than the first bout. With Pacquiao riding momentum as WBA Welterweight Champion and no rust to knock off, he could very well give Mayweather a run a for his money in the early rounds. Pacquiao will have to conserve his energy and land more than 19% of his punches this time around if he stands a chance of winning this fight. However, there’s a reason why Money Mayweather has never lost in the ring. His defensive tactics and ability to fight a full 12 rounds without fatigue has been a reason why he has an unblemished record. At 41 years old, Mayweather physically looks like he’s in top shape. He has come out of retirement to win before, and we believe that Mayweather will add another win to his unscathed record to reach 51-0. Prediction: Mayweather defeats Pacquiao by technical knock-out in the 9th round.